Sitting comfortably in a vehicle, office or at home, besides design characteristics, requires excellent physical support of the material to the exposed body segments. An uncomfortable seat can cause well-known pain such as lower back pain, which is nowadays become as "chronical" pain among all the seated workers. 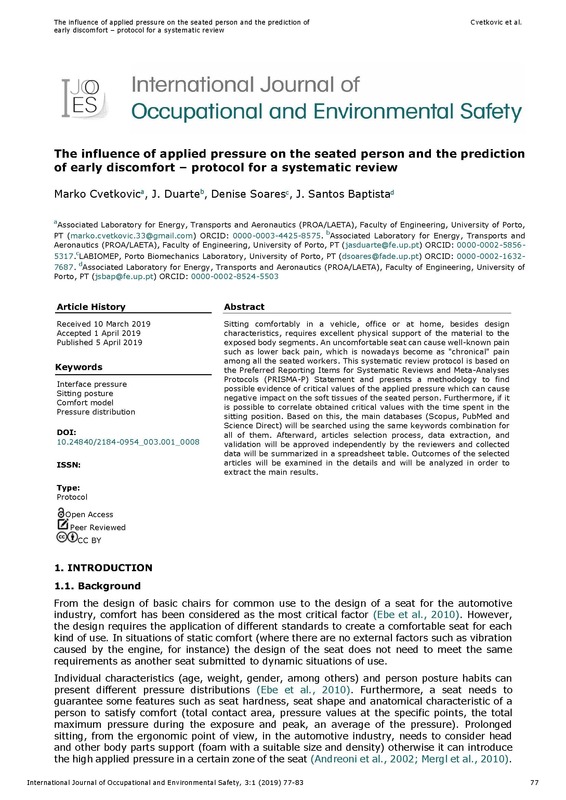 This systematic review protocol is based on the Preferred Reporting Items for Systematic Reviews and Meta-Analyses Protocols (PRISMA-P) Statement and presents a methodology to find possible evidence of critical values of the applied pressure which can cause a negative impact on the soft tissues of the seated person. Furthermore, if it is possible to correlate obtained critical values with the time spent in the sitting position. Based on this, the main databases (Scopus, PubMed and Science Direct) will be searched using the same keywords combination for all of them. Afterwards, articles selection process, data extraction, and validation will be approved independently by the reviewers and collected data will be summarized in a spreadsheet table. Outcomes of the selected articles will be examined in the details and will be analyzed in order to extract the main results.